Chateau Elan is a resort country club community north of Atlanta in Braselton, Georgia and features three regulation 18 hole courses and the short Par-3, a 9 hole executive walking-only course. The Legends: Three great golf champions were asked to pick six of their favorite holes of all times: Gene Sarazen,Sam Snead, Kathy Whitworth. Completed in 1986, The Legends of Chateau Elan offer fairwaysthat are beautifully contoured with roughs of bermuda grass, and lakes and ponds that have been stratigically placed throughout the course. Home of the Annual Sarazen World Open Championship. The Legends is for members, their guests and hotel guest only. Membership options for both residents and non-residents. Chateau Elan Course: Designed by Denis Griffiths, 1030 yards, Par 71 winding along three lakes and two creeks with water hazards on 10 of the 18 holes, 87 bunkers and overlooked by luxury homes and estates. Chateau Elan offers a strong test of player skills. This course is open to the public. The Woodlands: Denis Griffiths designed this picturesque 6735 yard, par 72 course in 1996 and features pristine lakes, spectacular views from numerous elevations and once again surrounded by beautiful luxury residences. The fairways are tight, with many balls permanently hiding in the woods. The greens have subtle breaks and need a good eye. 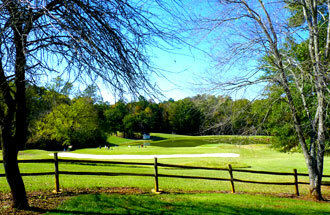 THe Par-3 Course: This 9 hole course is open to the public and is walking-only. From the farthest tees this par-27 has a total distance of 1,066 yards. While short, it is also still challenging and great for a quick game. Spread out among the beautiful North Georgia foothills you'll find a simply spectacular golf and winery community called Chateau Elan. The vineyards were first planted in 1981, the outstanding winery completed in 1984 and the equestrian center was finished in 1994. Fabulous golf, amazing swimming and tennis, running and bike trails, spas... this is a community built for royalty! This simply amazing lifestyle offers a range of neighborhoods including modest $300k homes up to $3m+ for its luxury corporate estate homes. This community is unlike any other and is a shining star for Atlanta real estate. Much of the value of the Atlanta homes in Chateau Elan is in the community itself. If the location 40 minutes north of downtown Atlanta is comfortable for your commuting situation, it absolutely deserves a look.